This is a very popular dish in Java Island. Served on Eid ul-Fitr day which marks the end of Ramadan, the fasting month. Together with ketupat / rice cake & Opor Ayam makes the perfect day to celebrate the biggest religious festival in the nation. 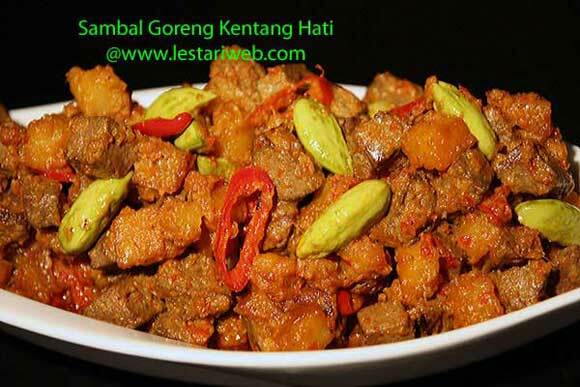 In East Java region, this dish is even mandatory menu for selamatan or communal feast. The selamatan goes back to pre-Islamic, Hindu-Javanese or Budhist-Javanese traditions. Selamatan is performed to celebrate almost any occasion, including birth, marriage, death, moving house, etc. Together with Mie Goreng, Kering Tempe and last but not least Daging or Ayam or Telur Bumbu Bali, Sambal Goreng Kentang Hati will be arranged in a banana container called "Takir/Berkat" and sent to our neighbours as an announcement, invitation or just an expression of sharing happiness/tragedy, it depends on what's occasions. Note : There are several variations of Sambal Goreng seasoning, some recipes suggest sliced seasoning instead of pounded one. Each version is unique and delicious!! I got this recipe from my grandmother and I still use it today because I think it tastes best lol ;-). A touch of chilli & tamarind juice brings a little bit sour-spicy taste, quite mild not so heavy taste of coconut milk flavour!! This is a basic spice paste for Sambal Goreng Recipe. 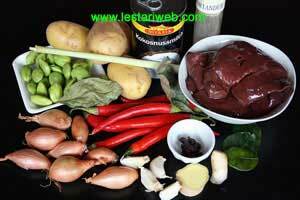 You can replace the main ingredient as you preferred for example you can cook with beef/meat, called Sambal Goreng Daging, with Egg call Sambal Goreng Telur, with Shrimps called Sambal Goreng Udang etc. Try your own version & good luck. 1 Pour-in 1.5 liters / 3 pints water in a large saucepan. Add 1 tsp salt, 1 bay leaf, 1 kaffir-lime leaf, a bit slice of galingale & ginger. Bring all to boil. 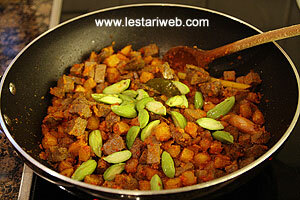 2 Add the beef liver & bring over medium heat until well cooked ( approx. 20 minutes). 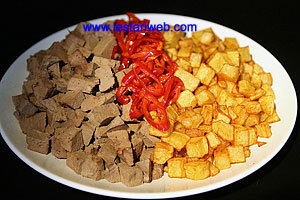 Cut the beef liver into small pieces or dice. Put aside. 3 Peel-off the potatoes, dice & soak in water to prevent brown colour. Set aside to drain shortly before frying. 4 Heat enough oil & deep-fry the potatoes until goldbrown. Set aside to drain. 5 Fry the sliced chilli in a used oil shortly. Set aside to drain. 6 Meanwhile soak the tamarind pulp in warm water. Squeeze the tamarind pulp constantly to extract the flavor into the water. Drain the pulp and save the tamarind juice. 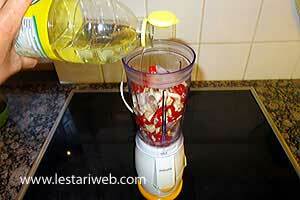 7 Put all the ingredients for the paste into a blender and blend until smooth. Add a little bit oil if necessary to help the blending process. 8 Heat 2 tbsp used oil in a wok or shallow pan. (Don't add oil if already added during a blending process). 10 Add the potatoes & liver. Stir to mix. Then add the stinky bean (or sugar peas if used). 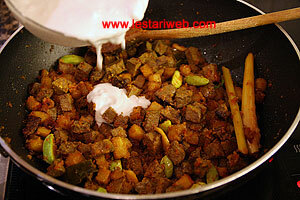 11 Add the coconut milk and tamarind juice. 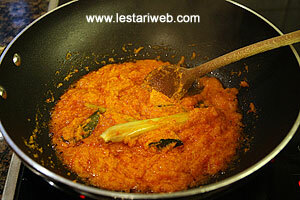 Continue simmering over medium heat, uncovered, till the sauce becomes thicker. Stir occationally. 12 Adjust the seasoning, add the salt and sugar to taste. 13 Add the fried chilli. Stir to mix & remove from heat. Serve while hot.